Look at your face, chest, and arms – are they as youthful as you’d like? 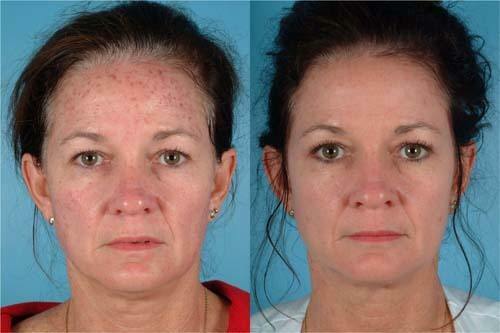 Skin treatments using the photorejuvenation process represent a breakthrough in age-defying skin care. This new technique treats skin damage non-invasively — there is no disruption of the skin’s epidermal surface. IPL treatments address the effects of photoaging and sun damage with low risk of complications and no recovery time. Can any of these procedures provide significant improvement without interrupting daily routines? Aging, sun exposure and other factors can cause the appearance of broken capillaries and blood vessels on the face known as telangiectasias, which appear as spider veins. Sometimes broken capillaries can cause a diffused redness in the skin, called erythema, a source of social embarrassment for many people. Rosacea is a common skin condition that is characterized by diffused erythema. All of these conditions respond well to IPL. For unsightly veins on the legs, both IPL and Nd:YAG laser technologies together are capable of addressing these lesions. During treatment, Intense Pulsed Light or laser light is absorbed by the blood in these small veins, heating and destroying the vessels. Over time the destroyed veins are reabsorbed and disappear. IPL systems can also be used to treat varicose veins, which are deeper, bluer veins. Any man or woman who shows the signs of aged and sun-damaged skin is a candidate for IPL Skin Treatments using Photorejuvenation. A brief consultation with an IPL specialist should provide all the information needed.